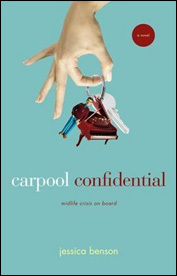 AUTUMN 2007 Jessica's latest book, Carpool Confidential, is now available. See inside the book and indulge by reading the excerpt. Order it today at barnesandnoble.com or amazon.com. MORE TO SEE ~~ Much Obliged, Jessica's RITA winning book, is now available with a gorgeous new cover. Order it online at barnesandnoble.com or amazon.com. ~~ Find out what Jessica has to say about the book and the Traditional Regency genre. ~~ Lord Stanhope's Proposal has been completely repackaged. Same story, different look. Find it in bookstores everywhere, or order your copy from either Barnesandnoble.com or Amazon.com. Check out the reviews! ~~ The Accidental Duchess has been called "a sparkling, refreshing story," "charmingly humorous," and "highly amusing" with "witty dialogue" -- read more from this review. Read an excerpt from the book. Order your copy from either BarnesAndNoble.com or Amazon.com. WELCOME to jessicabenson.com! Please browse around.